Black Friday Deals! Renewal Rates for Loyal Subscribers! Special Price for Returning Customers! Just look at the two New Yorker pricing pages below. I reached the top page by clicking on an email sent to me, telling me that I was a valuable customer, and inviting me to renew my gift subscriptions at a special rate. The offer is $69.99 for the first gift and $59.99 for each additional gift. 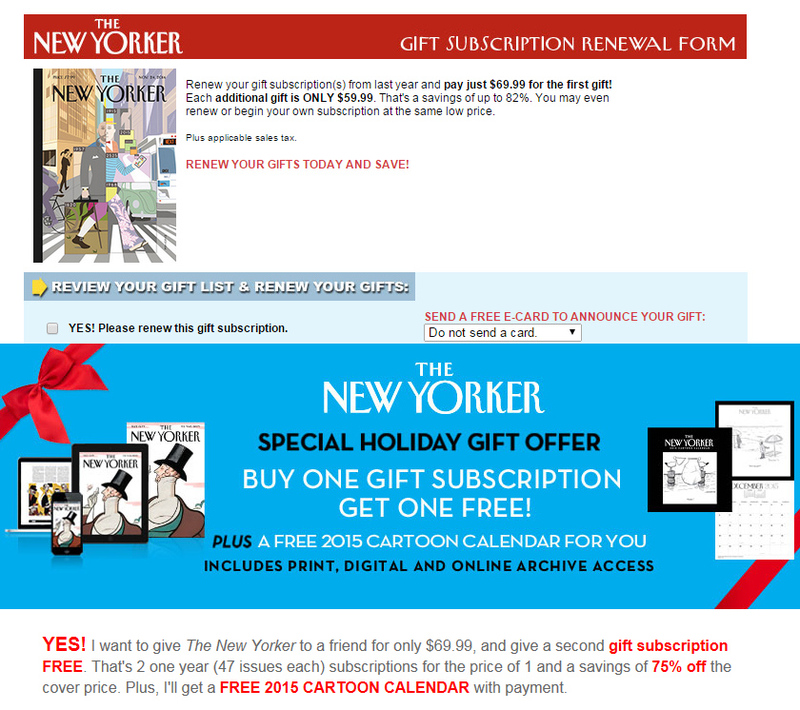 The bottom offer is one I found using a different web browser and going to the New Yorker website as if I’d never subscribed before. That page let me have two subscriptions for $69.99. I called the contact number on the sales page and the representative let me renew my gifts for the price offered to new customers. I saved $59.99 by not blindly renewing at my special, valued customer rate. It’s not only the New Yorker that charges you more if they know you’ve used their product before. Most, if not all, companies track your relationship with them and will raise the prices for people that they think they’ve already hooked. For example, Quicken will display a come-on for its latest version about once a year. The page you go when you click from the ad in the application for your upgrade usually displays a price that’s more than if you went to Quicken yourself. Unfortunately, the use of tracking cookies and other techniques makes it hard to show up on website as a virgin who deserves the most attractive pricing. But, you should try. Don’t sign up for any renewal or update or anything from an offer you get via email or from within an application. Keep enjoying your favorite products and services. Keep giving them as holiday gifts, too. Just make sure you shop before you buy! Just a heads up for people who have iPage hosting or are considering their services. I looked at my credit card bill today and saw an iPage charge that was $20 higher for hosting a website than I paid last year. No notice, no nothing. iPage just charged more for the automatic hosting renewal. The charge comes 15 days before the end of service I’ve paid for. So, I called iPage’s billing department. If the price really went up, then I wanted to move the site to another hosting service. I figured I move sometime this week, before the expiration of the hosting service I have already paid for. It takes 30 minutes on hold to reach an agent. The agent confirmed that they raised the price. She said that they can cancel my account and issue a credit on my card, but cancellation will immediately take down the web site that I paid for through October 14th. If I want to move the site before it’s taken down by iPage, she said that I will have to call billing back when I am ready for the cancellation (and wait another 30 minutes on hold, I guess). There is no way she can either reduce the price to what I paid this year or simply not let the renewal take place in October. I wonder if there’s some type of theft going on when they only accept immediate cancellations and take the two weeks of already paid-for hosting service ? Of course, I am not an attorney, and I am sure that iPage’s attorney’s would explain that they have the right to do what they’re doing because of some fine print somewhere. So, let me just say that their practices are user hostile and sleazy. I recommend staying away from iPage. The latest security alert is an official warning from the Feds! There’s a flaw in Microsoft’s Internet Explorer that bad guys can use to get into your computer and have their way with it. The technobabble US government warning is Brithish-like in its drollness. US-CERT [United States Computer Emergency Readiness Team, Department of Homeland Security] recommends that users and administrators review Microsoft Security Advisory 2963983 for mitigation actions and workarounds. Those who cannot follow Microsoft’s recommendations, such as Windows XP users, may consider employing an alternate browser. If you click through to Microsoft’s site in the link, you’ll see there is a whole list of rather difficult technical work-arounds that will, at best, “mitagate” the potential problem. For example, Microsoft’s first of six suggested work-arounds is to “Deploy the Enhanced Mitigation Experience Toolkit 4.1”. Others are equally daunting. Remember, after you’ve done everything Microsoft says, you’ve simply lessened the possibility that the bad guys will get through. The vulunerability is still in the Internet Explorer program. Plus, once you’ve implemented the work-arounds, you may discover that you can no longer do some things that you expect to. Why did IE originally have the settings and permissions Microsoft is now saying to change? I am guessing that IE probably needs them for some functionality you expect in a browser. Anyway, there is a much simplier way to avoid the problems in Internet Explorer. Even the government suggests it: use a different web browser. Both are free and fast. Just click on one of the links above, download and install the browser, and start it up. Make sure that you make the new program your default Internet browser so that Internet Explorer doesn’t run when you click on a link. Yes, if you switch away from Internet Explorer there will be some adjustment to a different look and feel. But, both Firefox and Chrome have a lot of free add-ons that make web surfing better. My favorites are add-ons that block ads and the annoying Flash ads. But, really, you have to switch for your own security. Even the government thinks you should “consider” switching!